How can we better monitor Yellowstone's dynamic hydrothermal system? Yellowstone Caldera Chronicles is a weekly column written by scientists and collaborators of the Yellowstone Volcano Observatory. This week's contribution is from Mike Poland, geophysicist with the U.S. Geological Survey and Scientist-in-Charge, of the Yellowstone Volcano Observatory, and Wendy Stovall, geologist with the U.S. Geological Survey and Deputy Scientist-in-Charge, of the Yellowstone Volcano Observatory. Last week, YVO scientists gathered in Bozeman, Montana, on the campus of Montana State University. The subject of the meeting? Yellowstone's hydrothermal systems! More specifically, how can we better monitor changes in the thermal areas of Yellowstone National Park? There are good reasons for wanting to know more about how Yellowstone's thermal areas work. From a public safety point of view, hydrothermal explosions—even small ones—constitute a potential hazard to visitors and Park staff. The protection of Yellowstone's more than 10,000 thermal features is another motivation. Ensuring that future infrastructure does not impact Yellowstone's hydrothermal heritage requires knowledge of how thermal features change over time. Yellowstone's hot springs are also biologic wonderlands and a place where geology and life intersect. They may hold clues about the origin of life on Earth! Hot spring cyanobacteria are wonders of life at high temperatures. Some live in water as hot as 167 °F (75 °C). At this temperature they are usually yellow, but become darker- orange, rust, or brown- as the water cools. Current monitoring systems are not well suited for detecting short-term changes in Yellowstone's hydrothermal systems. In fact, there is only one seismometer located within a geyser basin! 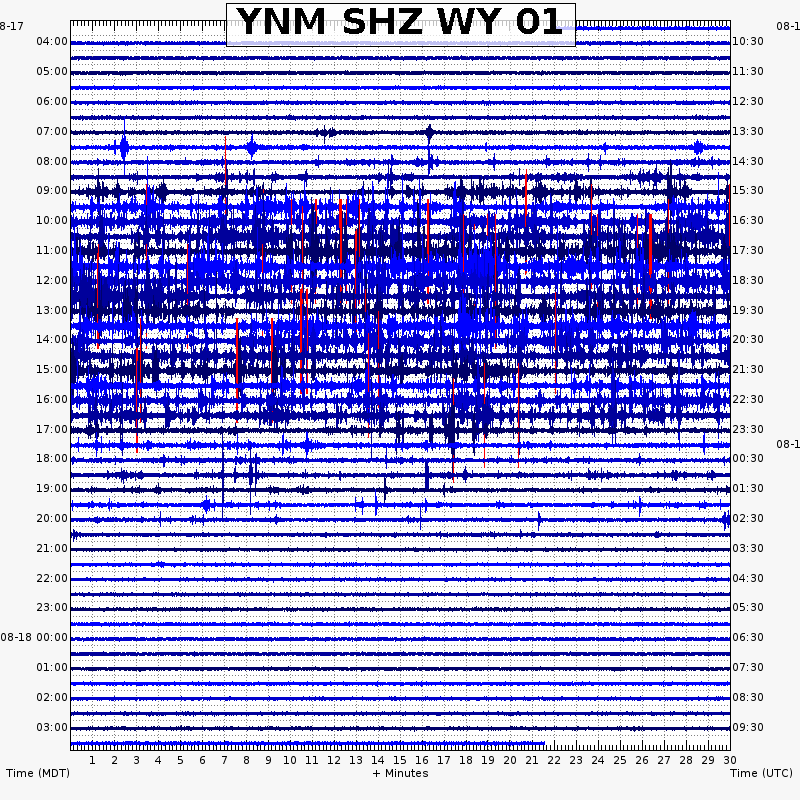 That's station YNM, in the Norris area—the station that best shows eruptions from Steamboat geyser. Most seismic stations are located away from hydrothermal areas to avoid the "noise" created by hot water moving around just beneath the surface, which makes it harder to locate earthquakes in the region. Scientists also do not have a good sense for how the composition of gases and water changes over time. The chemistry Yellowstone's thermal areas has been researched extensively over the past century, but there have been few studies that sample the same areas consistently through time. Continuous monitoring of Yellowstone's geyser basins would provide data before, during, and after interesting events. So far, scientists have been in response mode—after an event takes place, we leap into action to deploy additional monitoring equipment. Data that cover the build up to an event could be critical to forecasting future similar changes. As an example, take the Geyser Hill thermal disturbance in September 2018. A rare eruption of Ear Spring was followed by the formation of a new thermal feature (one that is now dormant). Scientists from a number of institutions responded, placing seismometers on Geyser Hill and collecting other data, but by the time the equipment was in place, the action was largely over. Were there measurable geophysical or geochemical precursors to the reawakening of Ear Spring and the formation of the new feature on Geyser Hill? We do not know, but imagine what might have been learned if a suite of seismic, deformation, chemical, and other measurements were being collected! Steamboat Geyser in the water-phase of an eruption on June 4, 2018, Norris Geyser Basin, Yellowstone National Park. Photo by Jamie Farrell (University of Utah). The recent eruptions of Steamboat offer a similar, but more promising story. No monitoring equipment, except the YNM seismometer, was in place near that geyser when it entered a phase of frequent water eruptions starting in March 2018. Fortunately, Steamboat eruptions persisted, and scientists from Yellowstone National Park and the University of Utah deployed seismometers around the geyser in May 2018. Those instruments recorded 4 major Steamboat eruptions before they were recovered in June, and the data yield tantalizing clues that there may be precursors to Steamboat eruptions. Just think—with continuous monitoring of Steamboat and similar thermal features, it may one day be possible to forecast eruptions of these intermittent geysers! There are many issues to overcome before any hydrothermal monitoring system can become a reality. Operating equipment year round in the harsh environment of the Rocky Mountains is a major challenge. In addition, data need to be available in real time, which requires radio communications. All of this work needs to be done without significantly impacting the landscape or diminishing the visitor experience. But YVO scientists are up to the task! In the coming months, we will be formalizing our plans for better monitoring Yellowstone's hydrothermal features. The last time a monitoring plan was published for Yellowstone was in 2006, when YVO focused on establishing new seismic, GPS, tiltmeter, and strainmeter stations, as well as adding additional river monitoring sites and conducting a survey of gas and water chemistry throughout the Park. Many of those goals have been achieved, so it is time to focus on new tasks and unknowns. The next-generation monitoring plan will address the 2020-2030 period, with a focus on continuing to upgrade YVO's monitoring capability throughout the Park—especially hydrothermal areas—utilizing new technology. When it is ready, we look forward to sharing that plan in a future edition of Yellowstone Caldera Chronicles. Stay tuned!